House has 5 Bedrooms, 3 Baths, (Sleeps 15-16), amazing views from the decks. Cotton Cabin is a 5 bedroom 3 bath lake house nestled in quiet Powder Mill cove on beautiful, clear Norris Lake, just off the main channel. The cabin is located just off I-75; approximately 40 miles north of Knoxville, and just 8 miles from LaFollette. Double slip, covered dock built in 2015 with composite flooring. Year round clear, deep water in large protected cove, making it a safe area for swimming and diving from the dock. Great bass fishing year round. There is a canoe for your use in the cove. Boat launch located approx. 10 minutes from home. Master bedroom has a beautiful Queen log bed with private bath and Jacuzzi with beautiful lake views. The wood walls and ceiling give the main room a very cabin like feel. Main floor has open living area and a fully equipped kitchen with island with granite countertops. Dishwasher, dishes, pots & pans, utensils, silverware, coffee maker, etc. all provided. Stacked stone wood burning fireplace. 2 main floor bedrooms all with log beds(one full size in one room and twin bunk and another twin bed in 2nd room). Basement level recreation room with kitchenette, pool table, air hockey, TV. 2 lower bedrooms(one room has a queen and a full-size bed, the other room has 2 queens) with shared bathroom. Washer/dryer located on basement level. Wrap around decks on main and lower levels with a swing on the lower level. Wood steps along the side of the house leading to a packed gravel path which descends to concrete steps which take one to the dock. Minutes from Peninsula/Deerfield, Springs Dock. Just around the corner from Deerfield's championship 18-hole golf course. Non-smoking only. No pets allowed. I have always loved the water. My family often talked about having a place on the lake. I bought a wooded, secluded lot and had the Cotton Cabin built on it. Many memories have been made at the cabin and on the lake. This place is so peaceful, a great place to truly 'get away' from all the melee of life! This lot sits on Norris Lake, arguably the cleanest lake in the region. I kept most of the trees on the lot to give it a sense of seclusion and still being in the woods, but lake views still abound here. Powder Mill Cove is not a high traffic area; thus, it is safer for children (and all lake-goers). However, the cabin rests within sight of the open channel of the lake and all the water sports and fun one can imagine. Enjoy the quiet deep water cove while sipping your coffee from one of the 2 large open decks. Cast away your cares as you enjoy all the fun Norris Lake has to offer. toilet, shower, jetted tub, Adjacent to the master. toilet, combination tub/shower, Main level. toilet, shower, Rec room level. The closest marina / resort is Springs Dock. Other resorts close-by include Flat Hollow, Sugar Hollow, Shanghai Resort, and Powell Valley Resort, along with Deerfield. Beautiful lake views from all decks as the home sits on a lake front lot. Deep water cove. Safe for children. Within sight (1/2 mile) of the main channel where one can enjoy boating/skiing/etc! Two refrigerators on the main level. One is older and not hooked up for ice/water, and is meant to be used as a backup for drinks or overflow. Two tables, one seating 6-7 and one seating 4, and a kitchen island with stools seating 3. A variety of board games are available in the coffee table in the main living room. Air hockey and a pool table are available on the lower level. A canoe is provided for your enjoyment. Deerfield - about 8 minutes away. We had a good time with family. Location - not too far from town or Springs Dock Marina (best place to get ice via boat), but access is via steep and curvy gravel road with no place to turn around a trailer in tow. I was unable to park my trailer near the house and had to leave it at the bottom of the gravel road in the grass. GPS does not correctly take you to the house from Springs Dock. Follow printed instructions. Accommodations - spacious with plenty to do in the event of rain (pool table, etc). Can comfortably accommodate saiid number of guests. Needs significant updating: curtains falling off walls, no internet. No reliable cell phone access. Don't plan to be a successful work anywhere employee. AC was great, even kept the loft cool. Extra refrigerator was definitely a plus, although very slow to get cool. Door knobs and locks on certain doors do not work well. Only thing that could make me a repeat renter would be internet access. Dock and cove on which house sits are excellent. Slope to dock is one of the more gentle ones on the lake making the climb easy. Wonderful place for a family reunion, Outstanding Dock! We had a wonderful family retreat, nice big house! We are boaters and very impressed with the new dock! Be warned, there is absolutely no cell service, not even texting near home or on lake which made me nervous when we were separated from kids or in case of an emergency at this part of the lake. Also, very unfriendly, agitated, grumpy old neighbor came to the door to argue with us, in front of the children, and scared the kids so much they were looking over their shoulder the rest of the trip. Some people! Overall a nice place, but we will probably go to a different part of the lake next summer. The house is very remote, and the road to it are steep gravel and unkept. I do not recommend taking the boat trailer to the house, leave it at the marina. We had an amazing time in this perfect home away from home. The entertainment space is perfect for a large group to all be together, there were enough beds and rooms to give privacy and comfort to all and we had everything we needed for the best weekend. The dock is perfect for jumping in the water and listening to music all day in the sunshine. Would highly recommend this home to any family or group! Loved our stay at the Cotton Cabin! The Cotton Cabin was so nice and worked out so well for my family. 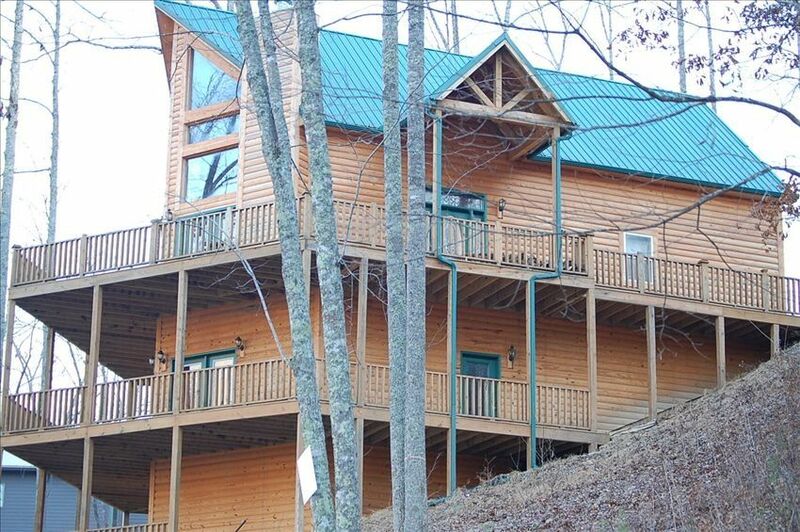 We rented the cabin for the weekend to celebrate Christmas and New Year's with my family from North Carolina. Hollis had left a Christmas tree and some ligts out on deck for us! The cabin is decorated so cute and the layout is so nice. We all had privacy but were still able to be together and not on top of each other. The kids had a blast with the air hockey table. All the adults enjoyed the pool table as well as the air hockey. With such a large family, the Cotton Cabin was perfect for us! We rented Cotton Cabin for a long weekend. My group of friends tries to plan a Norris Lake weekend about every other year. This cabin was the best!!! The location was ideal - close to marina and on one of the "fingers" so the boat traffic was minimal. The house was very well maintained and clean. There was plenty of parking. The only thing to note is that the master bedroom is a loft - so not very quiet when you have several people on different bedtime and wake up schedules. But, it was so nice....we can deal with that. Thank you, Cotton Cabin! We will be back! There are about 45 steps down from the main level to a packed gravel path which leads one down close to the lake. At full lake levels, one takes an additional 6-8 steps onto the dock walkway. Also, 1-2 boat trailers can be kept at the top of the driveway on the side of the road.